West’s Gabe Skaggs looks for an open teammate against North Adams. West’s Jordan Frasure stands out on the left wing against North Adams. West’s Dylan Bradford sets up the offense against North Adams. West’s LT Maynard tries to maintain control of the basketball on Monday evening against North Adams. West’s LT Maynard drives to the basket against North Adams on Monday evening in Waverly. WAVERLY — When tournament contests arise, upperclassmen are always supposed to take ownership of what is happening on the floor and provide leadership for their younger teammates. And during a Division III Sectional Semifinal contest between the West Senators’ basketball program and the North Adams’ Green Devils’ basketball program, West got exactly that from seniors Jordan Frasure and LT Maynard as well as junior Gabe Skaggs. Frasure and Maynard combined for 34 points on the evening while Skaggs was big in the hustle department as West started the game by opening up a 17-4 first-quarter lead, and Dylan Bradford’s 6-of-8 shooting from the free throw line down the stretch, along with a huge block and two critical treys from Blaine Weaver, were the difference in the Senators’ 54-42 victory over the Green Devils on Monday evening in Waverly. For Bill Hafer, the first-year head coach couldn’t have asked for a better start, or finish, to the game if he had tried. 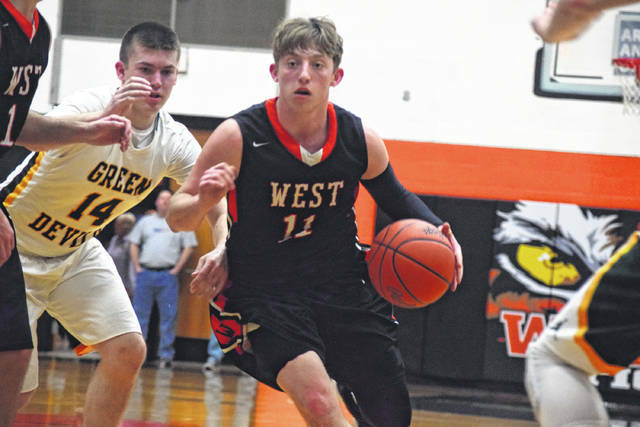 After the Green Devils scored on the game’s opening possession by way of a steal, West proceeded to completely lock North Adams up over the next 6:30 as four of West’s five starters got into the scoring column in an excellent display of basketball. Maynard, Frasure, and Skaggs were front and center in that run as the former scored seven of his 14 points in the opening quarter of action while the latter pair used their toughness and muscular frames to add four points apiece in the same frame. The result? A 17-0 West run that ultimately gave the Senators a 17-4 first-quarter advantage — thanks to the energy that Skaggs, who started the contest, provided the unit early on. While North Adams ultimately closed the game to nine points (23-14 and 25-16) on two separate occasions, Frasure made sure that the Green Devils would get no closer thanks to his play in the second quarter of action. On two separate occasions, the senior’s ability to rebound out of his own area led to critical baskets with the 6-2 swingman following up his own miss by laying a ball back into the net and adding a second offensive rebound and putback on a missed shot by Jessie Johnson en route to an eight-point quarter. Frasure’s 12 first-half points were vital as West ultimately held a double-digit advantage, 29-18, at halftime. But after Maynard and Frasure combined for seven points to allow West to hold firm on its double-digit advantage to start the third quarter, North Adams began to establish Austin McCormick in the low post. 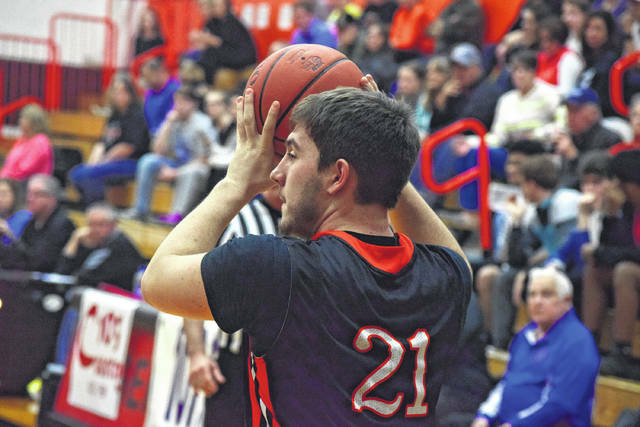 While McCormick only had two first-half points, his scoring ability in the low-post — as evidenced by his ability to score on three straight Green Devil possessions — allowed North Adams to close the West lead to 36-29 at the end of the third quarter. While Weaver ultimately responded with a big trey to start the fourth quarter of action, McCormick’s play in the low post opened up Ryan Shupert from the outside as the guard canned two consecutive three pointers from the right side to cut the Senators’ lead to a 39-36 tally with 4:55 to play in the contest. However, West’s senior trio of Frasure, Maynard, and Weaver showed the determination and grit that have helped spearhead the Senators’ improvement in one monumental fourth-quarter flash. 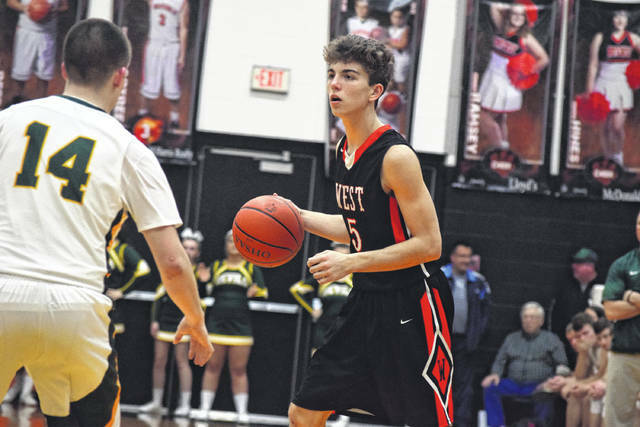 After Hafer called a timeout to talk to his unit, West’s patience on the offensive end paid off as the Senators, who worked the basketball inside to the low post, caught Weaver wide-open again from beyond the arc, and true to form, the senior canned a huge triple to give West some breathing room. But the Senators weren’t done. On the next possession, a North Adams miss was cleaned up by West, and Maynard, seeing the favorable numbers all the way, got to his sweet spot and drained a mid-range jumper from about a foot and a half outside the free throw line. Weaver then followed Maynard’s shot with a monstrous block on the other end, which ultimately led to another excellent offensive possession for the Senators as Skaggs — operating from the high post — made a great pass to Frasure, who canned the open trey from the left corner to cap off an 8-0 run that put the Senators ahead by a 47-36 margin. Dylan Bradford then capped the game off by going 6-of-8 (75 percent) from the free throw stripe to seal the deal. With the victory, No. 9 West will get a crack at No. 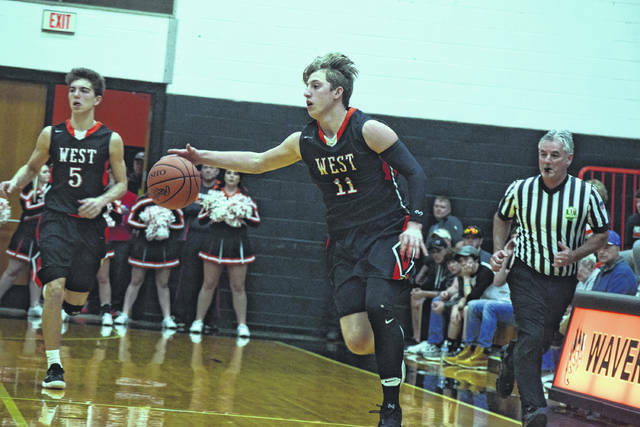 1 Piketon and its double-double, do-everything machine in Tanner Perdue on Friday evening at 6:15 p.m. in Waverly in a Division III Sectional Championship bout. 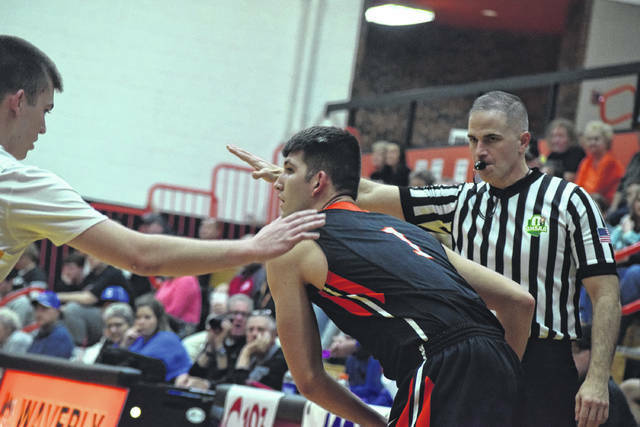 The senior forward is averaging 25.5 points and 9.9 rebounds on 55 percent shooting from the floor for the 17-5 Redstreaks — but Piketon has had its fair share of tight contests, as evidenced by its 4-1 overall mark in games decided by five points or less, including a 64-59 victory over Valley on January 31 in Lucasville.